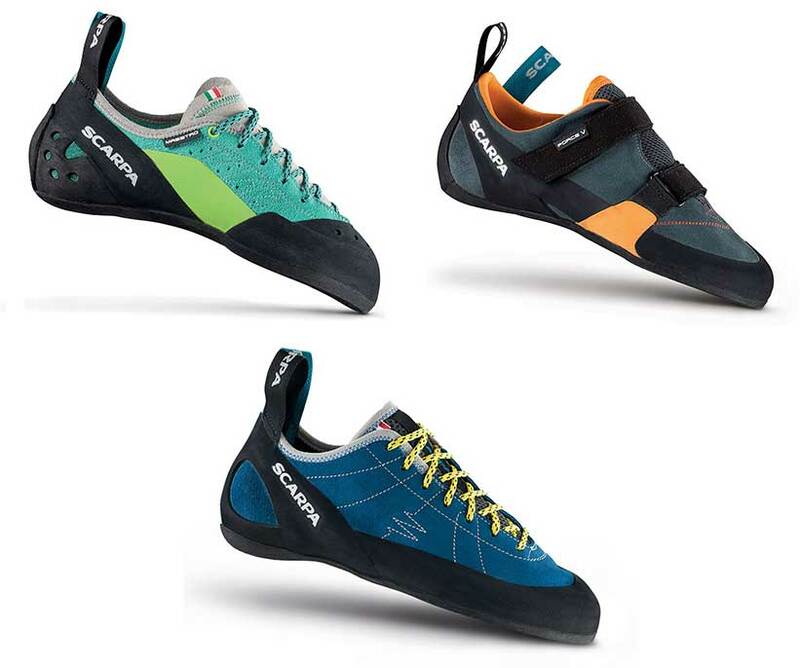 come in all colours, shapes and styles and it can be confusing even for an experienced climber to know which shoes are right for them. In this article I’d like to try and guide you towards making a better decision, whether it’s your first pair or your thirty-first pair. Robbie putting his SCARPA Instincts to good use! It’s important to understand that there are different needs for different climbers. What somebody starting out in the sport requires will be different to what a seasoned climbing vet needs. Just as someone who climbs a lot of Gritstone compared to someone who climbs a lot of steep limestone, the demands on the climber and the shoe are very different and this must be realised. 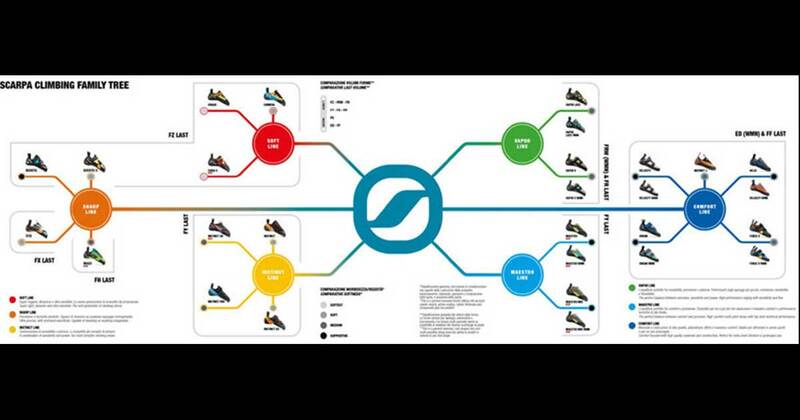 How Scarpa Categorise their Shoes. 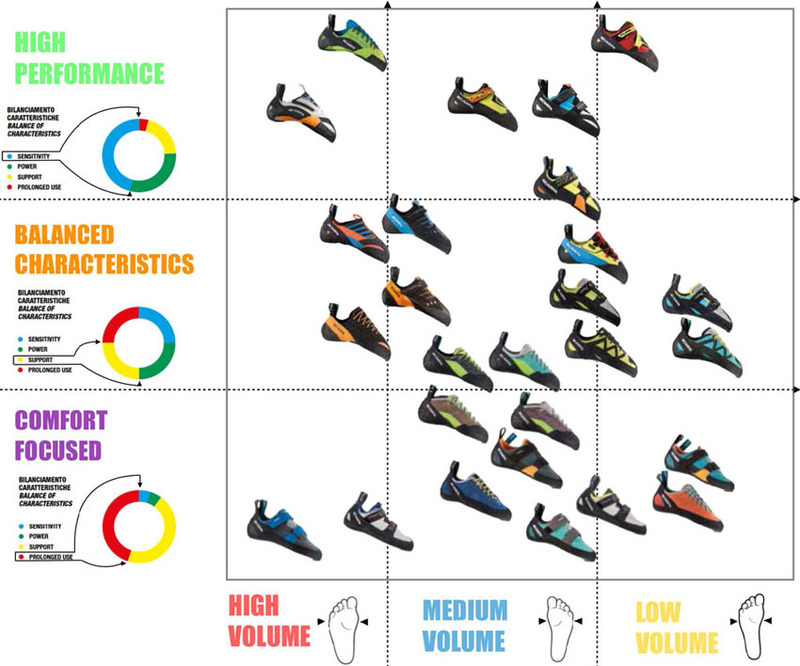 Since I started working with SCARPA, I have come to understand that the technology of climbing shoes is not as simple as I had once thought. 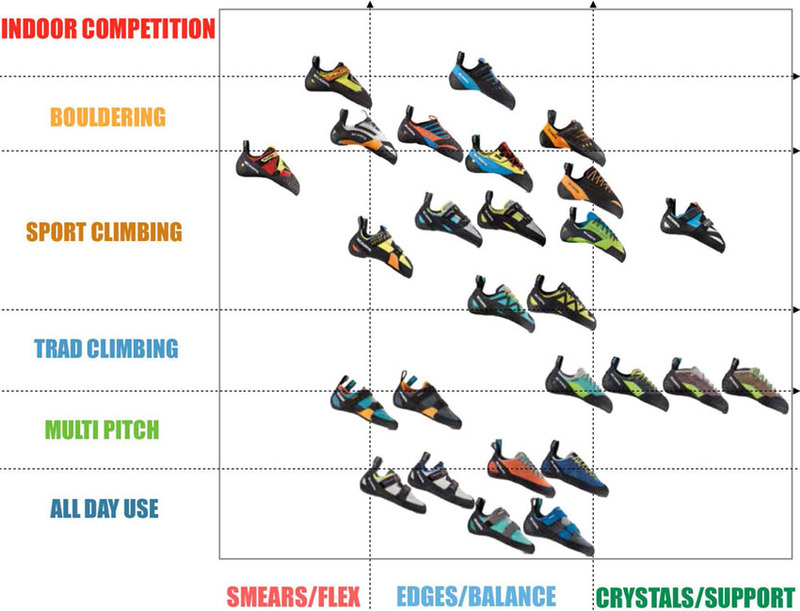 Just as with any technical product, improvements to design and the utilisation of new technology are constantly being tried and tested by those in the forefront of the game and it can be confusing to the climber to understand the minute details that make one climbing shoe better than another. 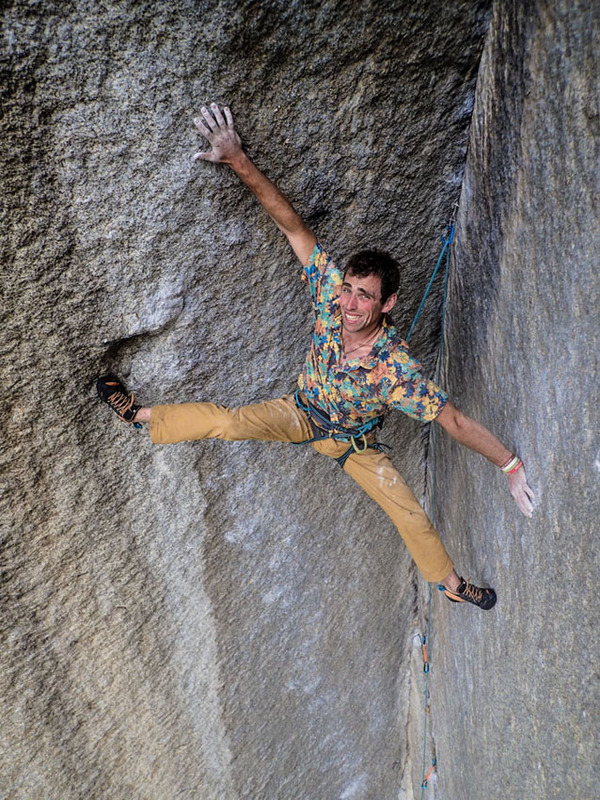 It is my hope that this article will not only guide climbers in this way, but that it will also enlighten many to the wonders of climbing shoe technology as well as showcasing SCARPA as leaders in the industry! A massive myth in climbing is that your shoes have to be painful to work. You won’t believe me how many climbers I’ve spoken to over the years who told me they got the tightest shoe they could withstand in order to stand on the smallest footholds possible. 3) You get put off climbing because you think it’s too painful for you! I’ll be dead honest here… I don’t climb in shoes that are painful. If I climbed in shoes that hurt me it would be more difficult to stand on tiny footholds. But there also must be a distinction between what is “uncomfortable” and what’s just a “tight-fitting shoe”. A shoe can be comfortable and also tight fitting, but the confusion happens generally with beginners who aren’t used to having their feet in such tight-fitting shoes and therefore believe that it is uncomfortable. It is generally a case of just getting used to wearing climbing shoes. As a beginner there is no point in going too extreme with the “Down-Turned” or “Asymmetrical” climbing shoes to begin with. As I said above, beginners generally find the transition between “street shoes” and “climbing shoes” difficult enough without forcing their feet in the most extreme types of climbing shoes designed for the most technically advanced forms of climbing. As a beginner, go for a flatter pair of shoe first as it will make the transition easier. They are built with a flatter body that contours to the natural shape of your foot rather than forcing it into a specific shape. This means that you’ll be comfortable whilst climbing and will be able to wear them for much longer. The general materials used such as leather, synthetics and rubber are all built to last. As a beginner climber, your technique won’t be as smooth and therefore your climbing shoes may suffer wear and tear quicker, but a Beginner model will be capable of withstanding this.